Fiscal Fitness Training For Money-Smart Kids™. When you use the Money Savvy Football, it won't just be first and ten. It will be first and ten, then twenty, then thirty. . . then fiscal fitness for your kids! One slot banks have been around for....centuries. But the world has changed. Now we have a highly sophisticated financial system, a system whose complexity has outstripped the ability of most adults, many of whom grapple with credit card debt, even bankruptcy. Personal finance education needs to start young. How? With a bank designed for the 21st century. 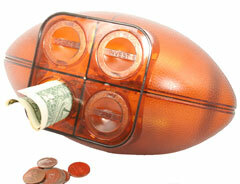 This football bank has multiple chambers to help kids save for multiple goals. There is one chamber for each of the four money management choices a child should be taught from the time they are small. They are SAVE, SPEND, DONATE, and INVEST. It gives a child a sense of control which leads to a sense of security. When you give children the Money Savvy Football, you give them control over the money in their lives. In a respectful way, the Money Savvy Football asks children what they think is the best choice and allows them to make it. A sense of control leads to a sense of security. In today's world, kids expect things to be interactive. Like the Japanese saying goes, Tell me and I'll forget...Show me and I'll remember...Involve me and I'll be changed forever. The Money Savvy Football involves the child, but on their terms. This involvement will give them good money management habits that will last a lifetime. The goal setting stickers give parents the opportunity to discuss choices, their implications, and values appropriate for each child. Just as new drivers are given lessons to learn how to control a car, your child should have a Money Savvy Football to teach them how to control money, one of the most powerful forces in life. Each chamber exits independent of the others. This 24-page book is the perfect accompaniment to any of our Money Savvy 4-chambered banks because it helps teach many of the same important concepts contained in our school curriculum. 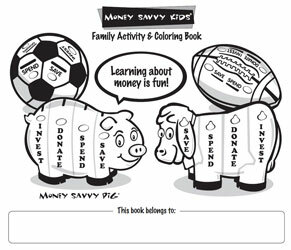 Kids can color the pages while they learn about important concepts such as bartering, interest on your savings, goal-setting, smart-spending, philanthropy, long-term investing and entrepreneurship. Other activities include establishing personal savings goals, creating a spending wish list, designing a worthwhile charity, holding a family money conference and a fun money word search. 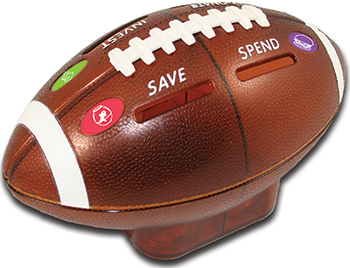 Click here to learn more about Money Savvy Kids @Home, featuring the Money Savvy Football. Is this a gift? You may use the gift message section of the order form to send a gift message. The message will appear on the packing slip. Also don't forget to order spare chamber plugs and additional stickers sheets if you think that you might need them! You will find these items behind the "Spare Parts" icon, under products for kids.